CMLS Financial releases in-depth November 2018 Commercial Mortgage Commentary. CMLS Financial announces expansion of commercial mortgage operations with new office opening in Winnipeg, Manitoba. CMLS Financial releases in-depth August 2018 Commercial Mortgage Commentary. CMLS Financial receives Great Place to Work® certification. CMLS Financial releases in-depth May 2018 Commercial Mortgage Commentary. CMLS Financial releases in-depth February 2018 Commercial Mortgage Commentary. CMLS Financial releases in-depth August 2017 Commercial Mortgage Commentary. CMLS Financial releases in-depth May 2017 Commercial Mortgage Commentary. CMLS Financial releases in-depth February 2017 Commercial Mortgage Commentary. CMLS Financial releases in-depth November 2016 Commercial Mortgage Commentary. CMLS Financial releases in-depth August 2016 Commercial Mortgage Commentary. CMLS Financial releases in-depth May 2016 Commercial Mortgage Commentary. CMLS Financial releases in-depth February 2016 Commercial Mortgage Commentary. 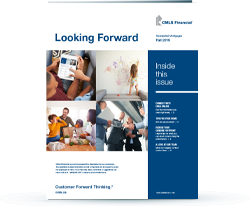 CMLS Financial releases in-depth November 2015 Commercial Mortgage Commentary. CMLS Financial completes $570 million CMBS transaction with third issue under the CCMOT banner. CMLS Financial releases in-depth August 2015 Commercial Mortgage Commentary. CMLS Financial releases in-depth May 2015 Commercial Mortgage Commentary. 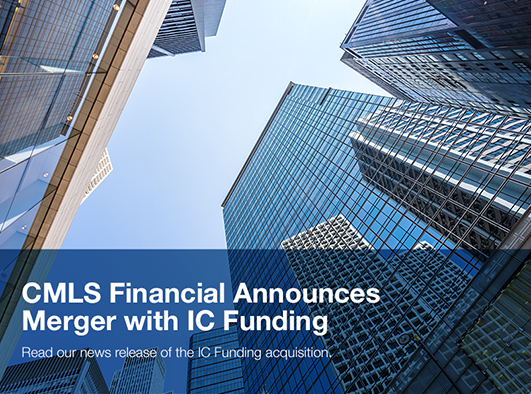 CMLS Financial provides financing for acquisition of a 465,000 sq. ft. office complex in the GTA. CMLS Financial releases in-depth February 2015 Commercial Mortgage Commentary. CMLS Financial releases in-depth November 2014 Commercial Mortgage Commentary. CMLS Financial releases in-depth August 2014 Commercial Mortgage Commentary. CMLS Financial closes $283.7 Million CMBS transaction. CMLS Financial releases in-depth February 2014 Commercial Mortgage Commentary. 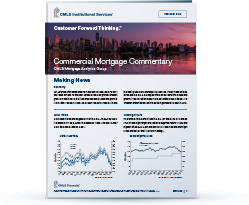 CMLS Financial Releases In-Depth Q3 Commercial Mortgage Commentary. CMLS Financial receives Commercial Servicer Ratings from Fitch. CMLS Financial provides financing for a prime North Vancouver property acquisition. CMLS Financial arranges $400 million Westin Hotel financing through CMBS and marks two industry firsts. Leading commercial lender CMLS Financial finances major real estate transaction for Quebec-based Groupe Mach.